Stylish bedroom concept with effects created with unique lights of the fall ceiling combined with sophisticated furniture for the modern home with no unwanted detailing. 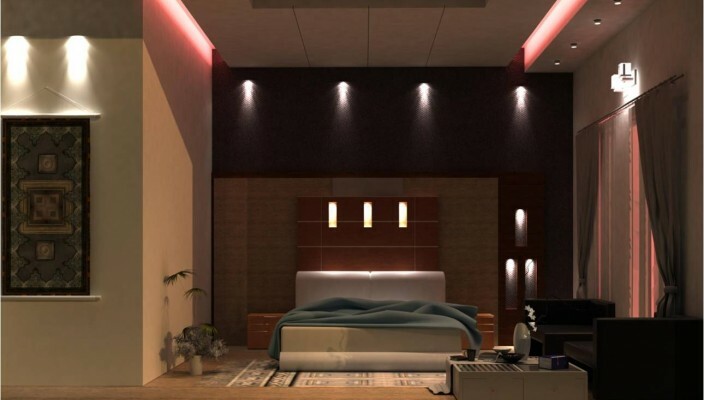 This sophisticated and stunning bedroom design is about bring hues to modern spaces with use of lights. There are no unwanted pieces of furniture here but what works is fall ceiling that has ample stylish lights to make a theme. Thanks to the black finish wall behind the bed, the lights create a solid impact, and this design works even for small spaces because the attention is on effects for creating moods in the bedroom.